I love the fall it is one of my top four times of the year that I love HA. But there is something that I dont like and that is all the Halloween stuff at the store. To be very honest I try to not take Zoey to the store because it scares her. I have to admit that it sometimes scares me too. Our neighbors this year decorated for Halloween. They put a big blow up pumpkin with a face one it in there yard and a pumpkin type skeliton out too. Zoey wants a pumpkin to. I have been having a hard few weeks. I have been extremely emotional. Every little thing has made me cry, I have felt like a failure as a mom and wife. I have felt overwhelmed by every aspect of my life from laundry, to Zoey, to keeping up with the house work. I have felt like I need a break from everything. This feeling of wanted to get away has not helped I feel like I should want to be with my kids but the truth is I have really been longing to get away. Jon told me this week that we are going to go to St. Louis for a few days in October. I hesitantly asked if we were going to take the kids and he said well we don't have to. I am so excited and scared to I have never left the girls with anyone except for max four hours. It is a work trip for Jon so he keeps reminding me that he will have to spend some time with the client he is going to see. But still it will be fun. One other thing is that this trip falls on the week of our four year anniversary. 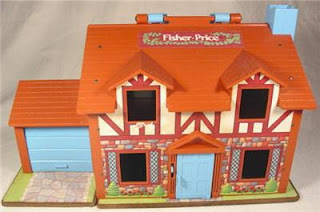 When I was little I really enjoyed my fisher price little people house. As a mom I have looked for the same house I had and it was really hard. This is a picture of it. I found this one on ebay. It is the first that I have found. No I didnt get it :( It sold for total with shipping for $60. Which is a really good price most I have found on ebay have sold for close to $100. The other houses are easy to find but for some reason this brown house is hard to find. Jon found some wooden people the other day they sell for $2 to $3 a person not to bad. He found 13 people and one that is cookie monster it sells for about $5. One of these days I might be able to get one. 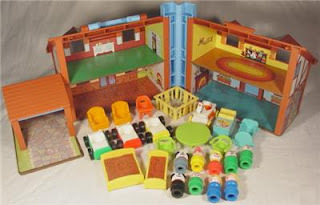 Did you ever have a little people house like this? So Jon and I were driving down the road and there was a car in the middle of the road with its hazards on. So Jon says to me should I stop and see if I can help. Which I said yes absolutely. So we pull up behind the car and Jon jumps out to see what is up. Battery is dead needs a jump. So Jon runs back to the car drives up over the curb turns around so he can jump the car and gets the jumper cables. So did I forget to mention the girl is 7 months pregnant and has a two year old and two of her high school brothers. Jon jumps the car twice and they drive off. But did not get far just up the road. So Jon pulled up and told her that she needed a new battery and he would go get one for her. She called her mom who worked right down the street so We took one of the boys with us to meet the mom who had the money for the battery and off we went to get one. We get back about 20 min. later and Jon helps put the battery in for them. The car started and ran great. I say all that to tell you that we were able to wittness to the boy and he had lots of questions. Please pray that he calls Jon or asks his pastor more about Christ. Well all the news since last time. We are going to have another baby!!! Yeah ! We are very surprised but excited. I am 13 weeks and due March 29th. This means that Noelle and the new baby will be 12 months apart. I am going to be crazy for the next few years so please excuse my craziness. The other fun new is that we got a new car. Long story but our 98 Honda Odyssey was dieing a slow costly death so we traded it while it was still running for a 08 scion XB. yeah for new car. Oh it is black. It is so nice to leave the normal everyday and go on vacation but it is also nice when you get home. Our vacation was very eventful good and bad. We had some car trouble after we got there. Praise the Lord it only cost $210 to fix it. We celebrated Jon's birthday while we were gone he was so excited about his present. He got a miter saw very nice. Over all it was a wonderful vacation!!!! I will post some pictures soon I havent downloaded them yet.